Transitional curve with angled bell shades creates a great new indoor look. Includes three 9 inch rods for adjusting height - Hang semi flushmount or longer. Ceiling plate easily fits over existing openings measuring 5" diameter. With its brushed steel finish and modern profile, this Globe Electric 1-Light Mini Pendant creates a cool, practical presence, like those found in large warehouses, artists' lofts, or retro-style barber shops. You will love the feeling you get after adding this to your home. Made of durable metal, the transitional-style shade offers a clean, casual look and general all-over room lighting. Fully dimmable with a compatible dimmer switch, you can create lighting ambiance and different moods easily. Includes all mounting hardware for quick and easy installation and requires one 60W medium base light bulb (sold separately). Globe Electric's Vintage Edison Squirrel Cage light bulb is recommended to complete the vintage-inspired look. Simple and completely versatile, the Finchley Plug-In or Hardwire Pendant is the perfect finishing touch for any room. Complete with a round vintage Edison bulb and a striking antique brass perforated metal socket, this pendant adds a touch of industrial style everywhere you place it. The black cloth cord and subdued color complement all interior designs and look great hung alone or in a cluster above a side table in your bedroom, living room or office. 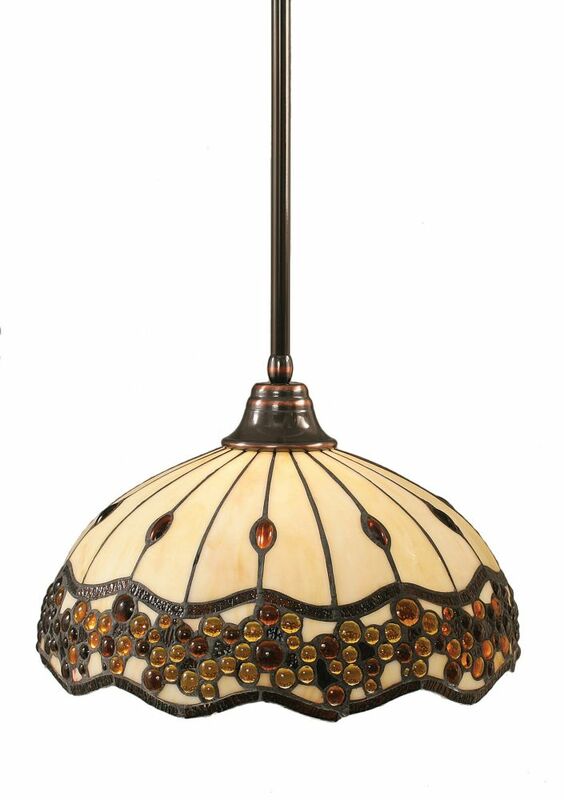 Concord 1-Light Ceiling Black Copper Pendant with a Roman Jewel Tiffany Glass The cornerstone of the concord Collection is quality, and this pendant is no exception. Combining a classic black copper finish and posh styling, you will find no better way to highlight the charm of your home. With the superb craftsmanship and affordable price this fixture is sure to tastefully indulge your extravagant side.